Post-apocalyptic fiction books aren’t just good entertainment. You can sometimes learn a lot of important survival skills from them, and improve your mental preparedness while enjoying them. 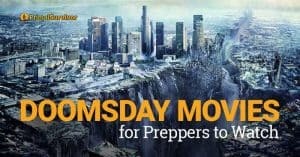 So, if you’ve already checked out these non-fiction survival books and enjoyed these top doomsday movies, you might want to give these post-apocalyptic books a read. *I realize that everyone has different tastes when it comes to books. I wanted to make sure this list went beyond my personal preferences (I tend to prefer stories about natural disasters and plagues over sci-fi heavy alien and zombie books). So, I compiled the list based on my favorites plus top recommended books found in forums online. Feel free to add your favorite titles and a small description in the comments! These dystopic end-of-the-world books might be older, but the themes still ring true! Alien’s invade the earth. At first, they seem to help humanity by eliminating disease and bringing about a Golden Age. But at what cost when the alien overlords do away with human culture and identity. This book takes place long after the apocalyptic event has occurred. The main character explores how the world has been reduced to tribal communities. It won the 1980 National Book Award for Science Fiction. The story takes place 600 years after nuclear disaster has destroyed civilization. All educated people have been killed as part of a “Simplification.” It centers around an engineer who strives to save books which could save mankind. Unlike many other post-apoc books, this one takes you through the entire cycle of pre, during, and post-disaster. It is very realistic and deals with a lot of tough questions, like how would you distribute your supplies? Would you keep someone in your group alive? The world has been destroyed by corruption and pollution. Now, humans struggle through turmoil, military rule, birth defects, and lack of resources. You might have seen the movie version of this book. It shows a post-war America trying to rebuild civilization. There is a lot of symbolism and sci-fi in the book, if you like that kind of thing. The book won loads of awards. Written in the peak of thecold war, this book deals with a world that has been destroyed by fallout. It is very emotional and shows how everyday people would react during a disaster. A plague has destroyed almost all of the earth’s population. A young boy struggles to survive in this brutal world. This book is a lot different than the TV series loosely based on it. It revolves around soldiers who launch a nuclear attack. After the attack, they find the world a very different place. The character development is great in this book. Also winner of many awards, Emergence revolves around the effects of bio plague. A girl name Candy, who is a type of superhuman called hominem (humanity’s next evolutionary step) attempts to stop survivors from killing off the hominems. These books made the list because they are either incredibly popular or influential. You’ll want to have them under your belt to be versed on the genre. This one always gets listed as one of the best post-apocalyptic fiction books. It is the love story of two young people who might be the last humans. You will also want to check out The Year of the Flood and Madd Addam by Atwood. A fungus has invaded the world and caused humans to lose their mental capacities. A 10-year old girl and a group of others somehow manage to retain their IQs. She must protect herself from being dissected by scientists looking for a cure. It has been made into a movie, but I haven’t seen it yet. This book blurs the lines between fiction and non-fiction. It goes into surprising detail about what could happen if an EMP weapon wiped out the grid and took us back into the dark ages. I’m not the biggest fan of zombie apocalypse stories, but this one is great. It is very raw and emotional, as well as getting deep into the sci-fi of what could happen from a single patient zero. Winner of the Pulitzer Prize, even people who don’t like post-apocalyptic stories will enjoy this book. It is a highly-emotional story of what happens when a father and son journey across a devastated land with just a gun to protect them. Not your usual dystopian novel! It starts out with an actress witnessing the effects of a plague. Years later, the actress and her theater troop are traveling around the raged country making plays about life before the pandemic. Lethal plants stalk the world following a freak cosmic event. This is one of the most famous catastrophe novels of recent times and well worth a look. 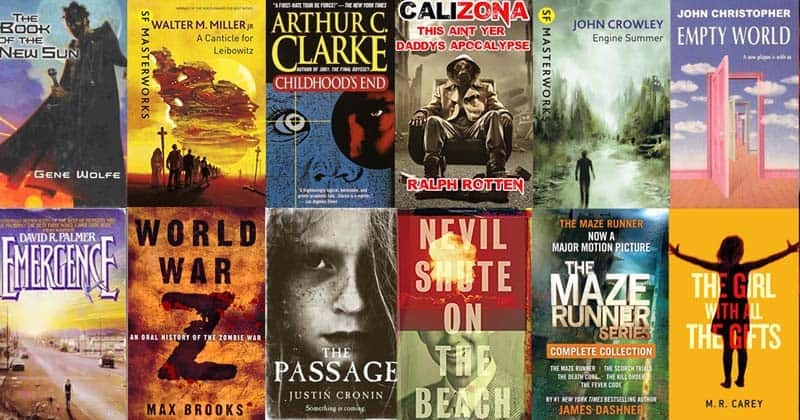 These are some of the top names and best-selling books in the post-apocalyptic genre. They might not be classics (yet), but they are great reads and highly recommended. Need something lighter? This is actually a funny book. It tells what happens when two survivalist/preppers build an underground bunker and fully stock it. When a meteorite hits, the guys discover that being kings of the apocalypse isn’t as great as they thought it would be. Without giving away too much of the plot, I can tell you that this book deals with a girl who grew up in a government facility. She knows all about the experiment that they are up to which will wipe out civilization – and only she can stop the end from coming. Regardless of what you think about Russian politics, you’ve got to admit that they have some amazing literature. This story takes you on a twisted tale of survivors living in the Moscow underground. These books are insanely popular and have been turned into a TV series and a movie due this year. It doesn’t deal much with end-of-the-world themes, but it does get deep into the survival mentality. In this story, civilization has been destroyed by war. Robots have taken over and one man’s mission is to destroy them before they destroy the rest of humanity. I might as well just say “any book by Hugh Howley” because he is one of the best-known post-apocalyptic authors out there. The level of suspense in his books is great, as well as the imagination which goes into his end-of-the-world scenarios. In case the list above isn’t enough dystopian fiction for you, here is a list of some more great post-apocalyptic books. Some of them you probably haven’t heard of yet. Set in New York, this book gives a realistic take on the consequences of a massive cyber attack. One man and his family struggle to survive in the ruined city. Classic good vs evil story somewhat reminiscent of a Stephen King novel. Follows various characters across the US as they try to survive the aftermath of a nuclear war. One small town in Florida is miraculously spared following a nuclear holocaust. This is the tale of how a group of ordinary people fight to stay alive. Strange mix of horror, suspense and comedy. This is a teen novel that touches on some diverse subjects; alien invasion, EMP attack, plagues. A science fueled saga that spans millennia. This is an epic book covering 5000 years of humanity’s future following a catastrophic meteor shower. A tale of global disaster and survival which was nominated for the Arthur C Clarke award in 2013. Explores the aftermath of a global flu pandemic. The usual stuff about the breakdown of modern society. This one takes an interesting angle and looks at it through the eyes of a married couple. Follows various characters as they try to come to terms with an EMP style attack where all modern technology is rendered useless. An epidemic of blindness hits a city, only one person is spared and the story is told from her perspective as mankind descends into chaos. A vision of the world following a mass famine. One man and his family attempt to survive as the world plunges into barbarity. An event 230 years ago kills almost every living thing. The only people left, live in the grey wastelands and fight for survival in the savage new world. Bestseller about survival following a total collapse in the economy. Hyperinflation cripples all commerce and infrastructure fails indiscriminately. Unique book from a Finnish author reminiscent of some of Margaret Atwood’s work. Set in an alternative present it explores what makes a society and how it can be manipulated by an all powerful government. Set in a dystopian world with America on the decline. This is an entertaining story about staying alive in a war torn land. Action packed, survival story, follows the main character as he tries to survive following a lights out event across the free world. Set 1000 years from now, the original world having been destroyed by plague, we follow an expedition that sets out to find the technological wonders of the old world. A novel of post nuclear America. All technology is now considered evil and large cities are banned. Follows the two main characters as they search for more meaning in their shattered lives. Story of an isolated community trying to save itself post holocaust. Deals with the subject of cloning as the community becomes desperate to survive. Finally here are some of the books our readers have recommended. Leave your pick and a short review in the comments to be featured here. From Michael: Set about 100 years after the nuclear holocaust a band of people roam about what’s left of the USA and deal with evil along the way. The are published in book and (my favorite) Graphic audio… a movie in your mind… as they put it. From Evets, Alex and Bob: The first post-apocalyptic book I read, probably when I was about 12 years old. That’s the book that hot the whole ball rolling for me to always be prepared. Omnia Paratus! From Jeff Jamison: These books are Juvenile Fiction but I have found them enjoyable. (I have teens). About when Canadian high school students on a trip to Disney are stranded by an EMP. Each book is about a different group and how they get back to their province in Canada. One group goes by Land, one group goes by boat, and one group stays at Disney. 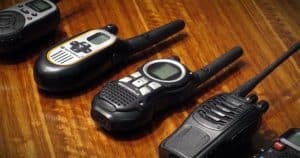 Their main teacher is a prepper, and her advice and skills help all three groups. From AA: Set in a post apocalyptic world- millennia in the future. The apocalypse event was invasion by a species from another planet. No matter what you think the man, and science fiction, this was an entertaining book. From AA: Best i have read. While the earth is not destroyed and there are no zombies or aliens, it is about survival of a neighborhood where some are prepared and some are not. great read for suburban survival. What are your favorite post-apocalyptic books? Any that I missed? Feel free to add your favorites in the comments below! The first series is set about 100 years after the nuclear holocaust a band of people roam about what’s left of the USA and deal with evil along the way. The Second is set about 100 years after Deathlands. It is similar to Deathlands. The are published in book and (my favorite) Graphic audio… a movie in your mind… as they put it. Yes, one of the best books I’ve read. Absolutely! The first post-apocalyptic book I read, probably when I was about 12 years old. That’s the book that hot the whole ball rolling for me to always be prepared. Omnia Paratus! Once again, a Great article! I have read almost all these books, and I have noted the ones I haven’t and are going to go to Amazon and buy them. I must say (IMHO), that for a person new to the survival genre, he/she should read “One Second After – William Forstchen”!!! It is Amazing. Oh, he now has the sequel out to this book called “One Year After”. Thanks for the recommendation, I’ve heard good things about that book, will check it out. it would be useful if these books are available in e-versions via Scrbd fo example . Finally someone mentions Ben Raines, all time favorite. Got the Audio book and need to get it turn into CDs. The Survivalist series by A. American, and the One Second After/One Year After are all very good books. Enjoyed reading all except the last 2 of The Survivalist Series which I’m getting ready to buy. These books are Juvenile Fiction but I have found them enjoyable. (I have teens) The Stranded Series by Theresa Shavers are about when Canadian high school students on a trip to Disney are stranded by an EMP. Each book is about a different group and how they get back to their province in Canada. One group goes by Land, one group goes by boat, and one group stays at Disney and then their journey to get back to Canada. 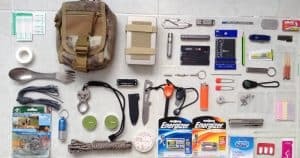 Their main teacher is a prepper, and her advice and skills help all three groups. Another book in the series is when they make it back to their town, and their story to rescue their town that has been taken over by a gang of violent, armed men. The series is fairly plausible in it’s descriptions of society after an EMP attack and main characters do die, so there is some realism to the stories. I must honestly say that the story in One Second After read like a Walking Dead episode and the writing is pretty bad. On that note, The Walking Dead graphic novels deserves place on the list. On a way-out-there book idea-L Ron Hubbard’s Battlefield Earth is set in a post apocalyptic world- millennia in the future. The apocalypse event was invasion by a species from another planet. No matter what you think the man, and science fiction, this was an entertaining book. I read this story and after about 10 minutes I was able to figure out who the aliens were what was really happening. Unlike 2001 a Space Odyssey which keeps you guessing this one didn’t. To me, this was a book about holding kids back until their ready for something they will never be ready for unless your stop holding them back. The storyline is easy to follow and reminds me of how easy it is to follow the storylines the press tries to feed us every day. The Dog Stars is my favorite. The characters are incredible. The audio version is amazing. Best i have read is “The Jakarta Pandemic” by Steven Konkoly. While the earth is not destroyed and there are no zombies or aliens, it is about survival of a neighborhood where some are prepared and some are not. great read for suburban survival. Day by day Armageddon and tomorrow war by J L Bourne are both outstanding series’s. Every single one of the books mentioned here are fantastic, fun reads. I noticed someone included The Stand by Stephen King. Might I suggest a few of my own picks? My favorite author by far is hands down, the King of Horror, Stephen King. With that, I posit he did not write just one post apocalyptic book or movie. My favorite is Cell, with the King asking in his typical style What would happen if… not that an EMP was set off, but worse, our cell phones were used as a terrifying new weapon? Ha ha. Ok, so with that fav out of the way, I can not say enough about the seven Gunslinger books he wrote about a gunslinger hunting the dark man. 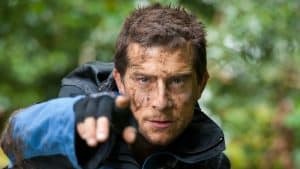 Great survival mentality and sideways looking examples of survival “tricks”. The other ones I will mention are not exactly my faves but get a nod because they are at the very least great books by the King and entertaining. Under the Dome (the book not the series); The Girl Who Loved Tom Gordon, a little girl versus a grizzly in the woods and how she survives…or not; Rose Madder, the King addresses mental illness and survival; Gerald’s Game, ok so it is not an end of the world book, but when I read it I definitely could see that in her eyes it was the end of her world and she is tasked with survival, this was one I did not like, but made it through. My favorite is Lizzy’s Story, and is the story of a middle aged widow’s survival, if I say anymore than that it will be ruined and everyone needs a surprise (not necessarily a good one), and who among us can fondly remember Stephen King’s first dip into the film industry? What, do I hear small voices whispering “Maximum Overdrive” from 1986. Many more including “The Running Man” starring Arnold Schwarzenegger in a futuristic world being run by game shows, Dreamcatcher starring Timothy Olyphant and Morgan Freeman in a pre-apocalyptic and start of the end due to an invasion? I could go on about more of his books, movies, and tv shows. It is getting late and I need to be able to drop off to sleep. Most of his work disturbs me enough to cause a restless sleep or is it “Insomnia” in the land of “Hearts in Atlantis” (with Sir Anthony Hopkins starring in the movie btw). Lol. Sleep sweet my fellow preppers. I will hopefully see you in Middle Earth somewhere in between Gondor, Rivendale, and the Kingdom of Rohan with some wonderful suggestions on how to survive the night in the Fanghorn forest in the midst of my travels.